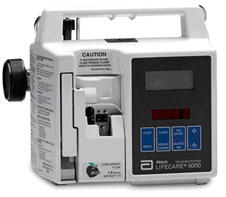 Save up to 80% on pre-owned Hospira (Abbott) Plum 5000 infusion pumps. One sealed, lead-acid, rechargeable 8 V battery, Internal to device. Accessible for ease of field replacement, with color-coded leads and polarized connector. Battery life (new batteries, full charge, at 20 C) approximately 500 mL total volume delivered or six hours of operation, whichever occurs first. 0.1 to 99.9 mL/hr (in o.1 mL. Increments) The total of the primary rate plus the secondary rate cannot exceed 99.9 mL/hr in Micro Mode. Note: while using the concurrent delivery feature in the Micro Mode, neither the primary rate nor the secondary rate can be less than 0.5 mL/hr. -2 to 10 psig. The maximum pressure is user-selectable from 1 to 10 psig, via the front panel touch switches.